Ancient and Primeval Beech Forests of the Carpathians and Other Regions of Europe - extension (Slovakia) is part of the Tentative list of Slovakia in order to qualify for inclusion in the World Heritage List. I am very happy to see that the sad story regarding Primeval beech forests WHS of Slovakia is coming to an end!!! I commented it in more detail in my review to the corresponding WHS. After more than 10 years, Slovakia state party will propose modifided nomination that should be in line with the WHS standards - it means sufficient protection, clear boundary and legal status, etc.. The existing sites will be re-nominated with modified boundaries and buffer zones (Havešová, Rožok and Vihorlat components will remain; Stužica-Bukovské vrchy component will be cut into two pieces: Stužica and Udava), and another component Kyjovský prales will be added. I have not yet visited the additional component. It has special regime because it is a part of military area with restricted access. I was ca. 3-5 km from the Kyjovský prales only... but not directly there yet. Despite the special regime, it is possible to visit the area. The schedule is published on-line. What I know, this somponent is of perfect quality and protection. Thus, it is excellent candidate to enrich this WHS. 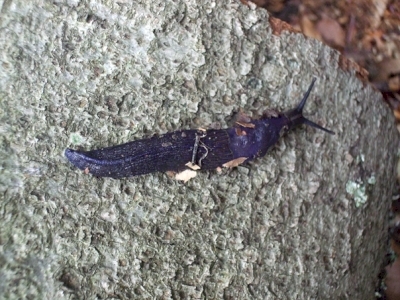 I include the photo of Carpathian blue slug (Bielzia coerulans) from Stužica-Bukovské vrchy component. I am happy to know that creatures like this will be finaly protected by highest possible level.